The wait for the all-new Toyota Supra is finally over with the official reveal at the 2019 Detroit Motor Show. It's been a long time coming but here is the official 2019 Toyota Supra. The hugely anticipated two-door coupe has finally been revealed at the Detroit Motor Show after the plethora of teaser images and spy pictures. The GR (Gazoo Racing) Toyota Supra, says the Japenese manufacturer was conceived as “a sports car in its purest form” with “no compromise that would diminish the driving experience”. A 335bhp turbocharged straight-six delivers drive to the rear wheels via an eight-speed ZF automatic gearbox for all versions. There is no manual on the cards but there have been murmurs that RHD markets might get one at a later stage. Power output sends the Supra from 0-62mph in 4.3 seconds with an electronically limited 155mph top speed. European versions of the GR Supra sport an active differential, operated by a dedicated ECU that monitors steering, throttle and brake inputs and engine speed and more to deliver the best handling. 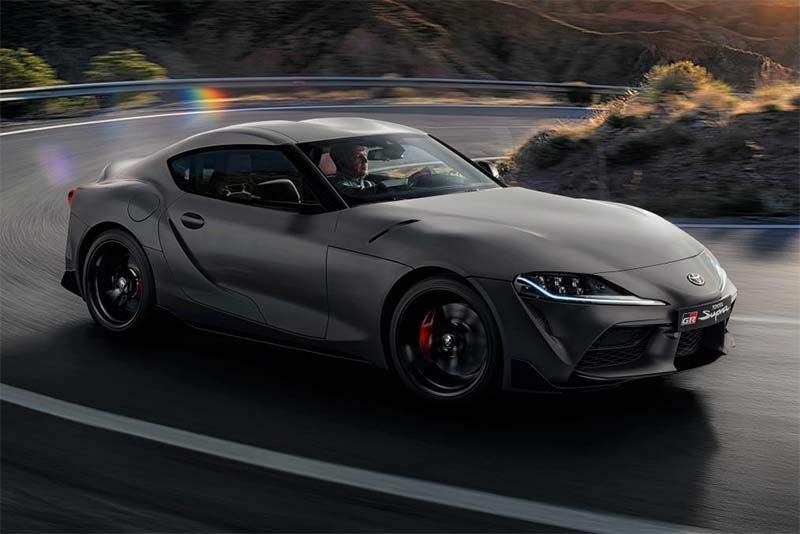 Toyota confirmed that the Nürburgring in Germany was used extensively to develop the new Supra to achieve “the most agile, stable and rewarding handling”. Although the new Supra has a shorter wheelbase than the GT86, it's 4,379mm long, 1,292mm tall and 1,854mm wide, making it longer, lower and wider. It sports wider tyres too, which should result in a sportier drive. In terms of design, it remains very similar to the concept it was based on, the Supra's body panels have been toned down while the concepts large rear wing is gone too. Toyota also says the all the vents and creases around the vehicle are functional for best drag and lift results and the long bonnet and double-bubble roof is inspired by the legendary 2000GT from the sixties and help with perfect front/rear weight distribution. Hop inside and the BMW influence in the joint venture is abundantly clear. Slip into the bolstered race-inspired seats and you're faced with digital dials, the infotainment screen, iDrive click wheel, climate controls and gear lever from the BMW parts bin. 19-inch alloys are standard across the range while Toyota offers a range of bold colour options in red, yellow and blue shades. Two variants, Standard and Pro, will be available initially, with both options receiving the alloy wheels, high-performance brakes, adjustable driving modes, adaptive dampers, dual-zone air-conditioning, keyless entry, LED lights and a rear-view camera. Choose the Pro option, and you'll get, among other extras, leather trim, a 12-speaker JBL stereo, a head-up display and a wireless phone charger. There will also be an exclusive Supra A90 Edition painted in matt Storm Grey, with matt-black 19-inch wheels and red leather seats. In Europe, prices range from £52,695 for the base 3.0-litre model up to £56,945 for a limited release top spec 3.0-litre A90 edition with deliveries due to start in the second quarter of 2019. Hit play on the video below for more from the launch.